After seeing a tv ad, we decided to order the Recharge Mower and I can honestly say, I'm totally blown away! 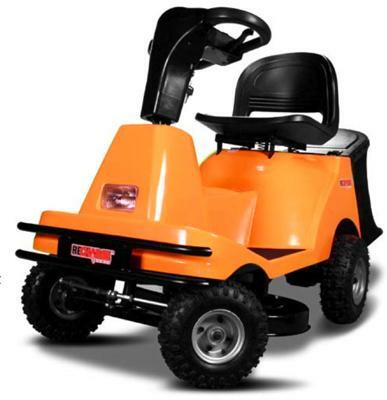 For the last few years, we've been using a stand up/walking mower but I've started to have knee problems so we choose to look into riding mowers. We tested out a few different models and were mostly unimpressed. Between the lack of variety in sizes(we have an older home with a smaller gate and we were concerned about getting it from the front yard to the back) and the enormous fuel costs, we had almost completely given up hope of finding something that met our needs...until we saw the ad for the Recharge Mower. We're a little on the green side, so the idea of a rechargeable mower was something we really liked and to boot, the fuel cost savings is phenomenal!!! On a single charge I can run the mower for about 3 hours and the cost to charge it is about 50¢. 50¢ to cut my grass 2 or three times! It's fantastic. It's also really comfortable to ride. I'm a larger man and found that a number of the other mowers had narrow seats and rode very haphazardly. The Recharge Mower rode like a dream and has a huge comfortable seat. It's got specifically sized tires to add a smooth ride to rough terrains. My favorite thing about the mower has got to be the sound. We've got two older dogs who really don't like loud noises. In the past, we've been forced to kennel them or take them out for walks when we've cut the lawn. Not anymore! Much to my astonishment, neither dog seemed to care much about the noise coming from the Recharge Mower...and honestly, I didn't even notice how quiet it was until they didn't respond. It's so quiet, it's even got a built in safety beeper built in. It's amazing! Now the most important thing about any lawn mower is the cut...and the Recharge Mower doesn't disappoint!!! With 5 adjustable settings, you can cut the grass to your preferred length. We like to keep the grass trim and cutting with the Recharge Mower is a dream come true! Our yard looks like a putting green!!! In closing, I can't recommend this mower enough. It's great and I'm absolutely in love with it!